“This past weekend, six houses in a West Adams neighborhood opened their doors — and their kitchens — to a parade of visitors celebrating the holidays. Put together by the West Adams Heritage Association (WAHA), the Silver Jubilee offered a self-guided walking tour of the neighborhood, or a docent-led progressive dinner, with each house serving one part of an elegant five-course meal. Originally envisioned by George L. Crenshaw as one of the region’s premier real estate tracts before the area even became a part of Los Angeles in 1909, Lafayette Square’s design was based on European cities, inspired to bring a feeling of tradition and graceful style not widely found in a very young Los Angeles. Crenshaw’s son Charles described the Square, and its central drive, St. Charles Place, as “a ‘Spanish pasear,’ a place where residents could stroll and meet socially.” Over time, Lafayette Square became home to many of Los Angeles’ luminaries including George Pepperdine, Sepulveda family descendent Princess Conchita Pignatelli, Fatty Arbuckle, Alexander Pantages, Norton Simon, boxer Joe Louis, singer Little Richard, and architect Paul R. Williams. Come with us this holiday season to experience the founder’s vision, as we stroll door to door, and socialize over a sumptuous meal, served one course at a time in each of the lavishly-decorated homes we visit. 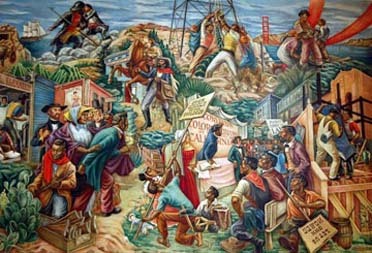 Saturday, June 4, 2011, Noon to 4 p.m.
WAHA presented a Spring Tour celebrating a century of accomplishments of African Americans who have contributed to Historic West Adams' civic and cultural legacy. Our tour goers visited the iconic Golden State Mutual Life Insurance building, designed by architect Paul Williams in 1947 for the first African American-owned insurance company established west of the Mississippi. The Late Moderne building with its notable integrated murals by artists Charles Alston and Hale Woodruff is on the road to becoming Los Angeles's newest Historic Cultural Monument. 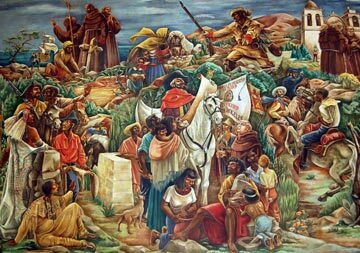 The murals, depicting scenes of African Americans' contributions to California history, are endangered, threatened with removal. This might have been the public's last chance to view them. Saturday, March 26, 2011 10 a.m. to 4 p.m. Historic West Adams is a new hotbed for fine art, with a growing number of artists who live and/or work in the community. Now, you're invited to visit a collection of West Adams' most interesting historic places, showcasing works by some of West Adams' most talented contemporary artists in their own homes and studios. West Adams Heritage Association (WAHA) presents Art in Historic Places: Artists of West Adams, a tour that opens the doors to eight diverse historic venues throughout West Adams, including Craftsman Bungalows, Spanish Revival villas, and an award-winning adaptive reuse of a 1920s commercial building into a loft that's been featured in Dwell magazine. WAHA is also creating a pop up gallery at the tour's starting point featuring works by all the participating artists. It's time to celebrate the Holiday Season with WAHA's annual Holiday Historic Homes Tour and Progressive Dinner - our wonderful, once-a-year opportunity to wine and dine in some of the finest homes in historic West Adams. On December 4 and 5, step back in time to holidays of yore in Harvard Heights, where seven of the grand manors of Westmoreland and Hobart Boulevard, all beautifully decorated, will open their doors to visitors. Learn more about the event and how to make reservations here. If you could meet the suffragettes responsible for women getting the vote, what would you ask them? What if you could interview the first "front page gal" who worked at a Chicago newspaper, in 1878? Or, what would you like to learn from the first African American to win an Oscar, or the first female African American police officer in the nation? 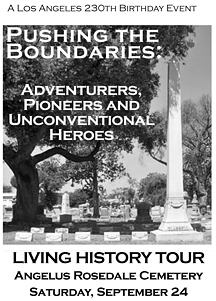 Meet these fascinating females, and more, at WAHA's annual Living History Tour, which takes place every autumn at Angelus Rosedale Cemetery. Amid the elaborate headstones and monuments, costumed actors bring to life - and tell the often-riveting stories of - a half dozen residents from Los Angeles' earlier times. This year's tour is slated for Saturday, September 25, and we invite your participation. Saturday, August 14, 1:30-4:30 p.m.
What better way to spend a summer afternoon than eating ice cream, socializing with neighbors and listening to musical entertainment? Please put on your summer whites or Victorian-inspired attire, and join WAHA at its Ice Cream Social, returning to West Adams after a too-long hiatus. In the 1980s and 1990s, WAHA tradition called for an annual Ice Cream Social, with sweets and frozen treats, games and lots of fun for kids and grown-ups alike. But as WAHA invented some new activities, the Ice Cream Social fell by the wayside, albeit with fond memories. This summer, WAHA is bringing the event back – and happily, at a great venue we are sure you all want to see. Bring the kids, and wear your summer whites or patriotic attire at WAHA's annual 4th of July picnic. WAHA's 4th of July is kid-and-family oriented, with historic preservation and plain old-fashioned neighborliness thrown in. Owners Karen and Robert Carrere are hosting WAHA's annual event celebrating America's birthday in their fab Gramercy Park gardens, which sprawl across two lush green parcels. Live music, courtesy singer/actor Matt Braaten, who will entertain us. Braaten performs as half of the singing duo Blue Sky Divide (though he will be performing solo for WAHA), and he'll be releasing his first solo CD later this year.